We are into our second year of roadschool in our rig and we have had several awesome learning experiences on the road. But, today, Roadschool 101 in our rig has made history. By far, today’s learning road trip tops the list of our epic learning adventures on the road. A few weeks ago, we realized that the Eagle Camp in Ft. Myers was not far from our where we are located. All the kids registered for the Ustream video notifications on their devices and have been watching the bald eagle with her nest of two eaglets. 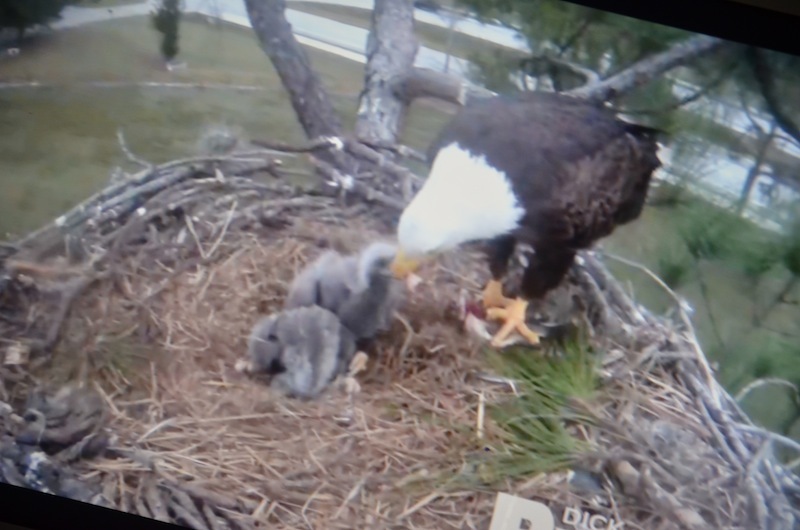 They have watched the Southwest Florida Eagle Cam as if it were a television show. After several viewing sessions, they now know what time of day to watch for feedings and other routine activities of this eagle family. The best part of it all, is the sudden inclination for all to know eagle facts of all kinds. What is the wing span of an eagle? Where is the Daddy eagle? 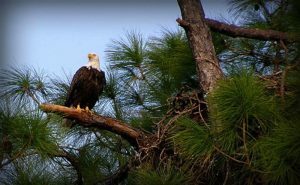 How long do the baby eaglets live in the nest? How long do eagles live? All these questions and more were answered in the first day of our road trip to learning all about eagles. We are studying eagles and their habitat this week and recording it all in a lapbook. It was about 4:30 this afternoon and had just started to sprinkle. We gathered in our rig near the front windshield as it faces the lake of the rv park. The Roadschool 101 crew know that when it starts to rain, the wildlife living in and around the lake become active. We have seen enormous fish jump out of the lake and watched birds of all kinds catch prey shortly before a big rain. Today was no different, but who knew we were about to get a bird’s eye view . We have seen the eagle that nests on the eagle cam soar in the sky above us on several occasions. Many times, the kids have watched her circle above the lake and surrounding area and subsequently watched the nest for her to return. We were fairly certain the majestic bird we watched from afar was the same one we watched up close and personal with her fledglings. Today, just moments after the raindrops began to fall and the breeze came ever so slightly across the lake, we seen the eagle. She circled the lake just twice and then descended like a shot just below the surface of the water. When she took flight, she had a fish in her talons. Our Bizzy Bee squealed, “Turn on the Eagle Cam!” The Roadschool 101 crew gathered around a computer and waited. 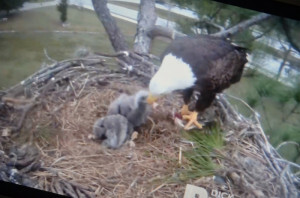 In just a few moments, the eagle with fish in tow, landed in the nest. She immediately started tearing off small bites of the fish with her beak and passing it to her young. They eagerly gulped down fish bites as fast as their mama could feed them. Our rig was buzzing with excitement during this 10-minute encounter. I couldn’t have timed the whole incident any better if I had tried. We have been studying eagles for a few days. Earlier today, we were going over vocabulary words and had come to a bit of a lull in the learning process. Enter: the excitement on the Eagle Cam. We are now regrouped and recharged to finish our study on this beautiful bird of prey this week. Can’t wait to see what our road trip to learning brings tomorrow.